First the Good News: NORTH COUNTRY possesses an absolutely stellar cast including Charlize Theron, Francis McDormand, Woody Harrelson, Sean Bean, Michelle Monaghan and Sissy Spacek. 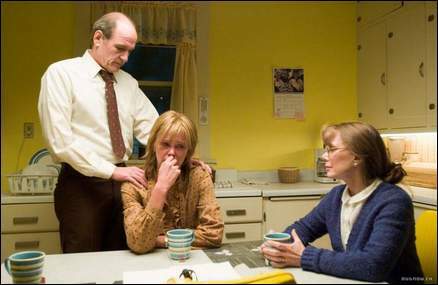 Add Richard Jenkins ("Six Feet Under"), whose especially compelling on-screen performance nearly steals the show, and you'll not find this much star talent assembled since the Continental Congress. More Good News: The underlying story is based on the real-life experiences of Lois Jenson who filed the first class action lawsuit for sexual harassment in American history. Jenson's heroic struggle for respect and equality is the kind of newsy narrative that Hollywood usually does best. In fact, the title probably should have been spelled NORTH CUNTRY given the rude, lewd and crude actions of the union jack-offs who comprise over ninety percent of the strip mine workers along the Mesabi Iron Range in Minnesota and whose apparent sole purpose is to dominate and denigrate the women who have the temerity to want a job that pays well. Now for the Bad News: Let's begin by saying that this production could have been the equal to such enduring screen gems as NORMA RAE or ERIN BROCKOVICH; all the filmic ingredients are there for this to occur. However, NORTH COUNTRY is riddled with factual "goofs" (one example -- there are multiple references to the Clarence Thomas/Anita Hill controversy which took place a full two years afterward) and it is undermined (no pun intended) by some insane wardrobe choices (Theron's FLASHDANCE attire was especially jolting). But the biggest blame must fall on the horsy head of Ms. Niki Caro -- the "director-in-name-only" and whose photo I have mercifully decided not to post given the trauma induced by the Ann Coulter picture appearing back a few months ago. Unfortunate appearances aside, if one ever wants to experience cinematic narrative dysfunction, then Ms. Caro's syrupy scenes in the courtroom provide an excellent case study. In fact, her directorial gaffes are so numerous and damaging it is a complete mystery why she wasn't replaced; a rhesus monkey would have been more competent and more attractive to have around. Thanks to Niki Caro all of NORTH COUNTRY is like the Port-A-Potty scene where Michelle Monaghan is trapped in a portable outhouse which is rocked and tipped by her male co-workers. It's a mess, it's a cinematic mess and, to paraphrase The Great Tonto, it's a "Kino Mesabi" mess.